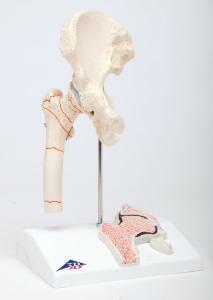 This hip joint model shows the right hip joint of an elderly person in half natural size. 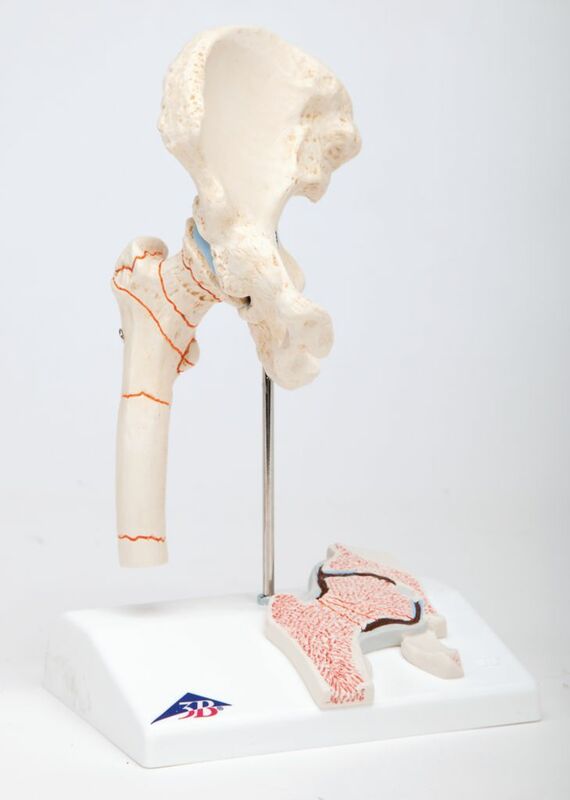 In addition to the external anatomy of the hip joint, a frontal section through the femoral neck is shown in relief on the base. The hip joint model shows the femoral fractures that occur most commonly in practice as well as typical wear and tear symptoms of the hip joint (coxarthrosis or hip osteoarthritis).The following fractures are shown on the hip joint: Medial femoral neck fracture, Lateral femoral neck fracture, Fracture through the trochanteric region (pertrochanteric femoral fracture, Femoral shaft fracture, Fracture of the greater trochanter and much more.